How to buy the book and what it is about. 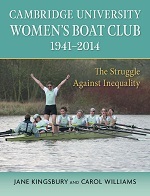 The book, about the history of women’s rowing at Cambridge University, is entitled Cambridge University Women’s Boat Club 1941 - 2014: The struggle against inequality, and was published by Trireme in March 2015. If you wish to use the internet, you can buy the book via Pudding Bag Books in Rutland, which sells via Abe Books or Amazon. so that we can post it to you. If you wish you may use the form below to do this. I would like to order ...... copy/copies of the book Cambridge University Women’s Boat Club 1941 to 2014 at a cost of £15.00 per copy. Postage and packing in the UK will be £3.00 per copy. Payment can be be made via bank transfer to the Nationwide account of Mrs M J Kingsbury, number 39035387 sort code 07-01-16. Cheques should be made payable to Mrs M J Kingsbury. Books will be posted on receipt of payment. Other outlets include: Heffers bookshop, Cambridge; and the River-and-Rowing Museum in Henley. The book covers the history of CUWBC from its foundation in 1941 by members of Newnham College Boat Club, who joined with members of Girton College Boat Cub to create a University rowing club for women, through to the announcement in 2012 of the participation by the women of Cambridge and Oxford in the Boat Race on the Tideway in London and to the preparations leading up to this race. It charts both the difficulties faced by the oarswomen and their successes during this period of nearly 75 years, from the time in the 1940s and early 1950s when there were only two women’s colleges providing crew members through the later 1950s when another women’s college, New Hall, was founded. It later describes how everything changed in the 1970s when many of the existing men’s colleges started to admit women, eventually in equal numbers with the men. In the 1980s and 1990s CUWBC reached a peak and experienced its greatest run of consecutive wins against Oxford. However in the early years of the millennium it is OUWBC which has been winning more often and so the gap is lessening in the table of wins for each university. A constant theme of the book is that CUWBC has always been the Cinderella of rowing in Cambridge, lacking resources and facilities throughout its history. The Cambridge oarswomen were not alone in this. In the 1950s oarswomen in Oxford were also struggling when they were banned from the river for almost a decade and lacked funds so that the races between the two universities were suspended. In the 1960s Cambridge oarswomen too faced similar opposition and the threat of a ban from some oarsmen on the Cam. Both clubs survived, however, to reach the point where the oarswomen now have parity with the oarsmen of the two universities in the Boat Race on the Tideway. Fully illustrated throughout, the book also contains a wealth of information about the extraordinary women who managed to combine rowing for the university with their studies and about how afterwards some of them went on to row internationally and to represent their country in the Olympic Games.